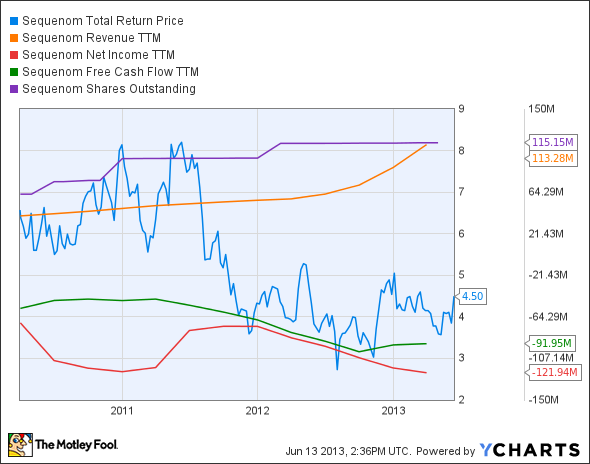 Is Sequenom Stock Destined for Greatness? Let's see what the numbers say about Sequenom (SQNM). Investors love stocks that consistently beat the Street without getting ahead of their fundamentals and risking a meltdown. The best stocks offer sustainable market-beating gains, with robust and improving financial metrics that support strong price growth. Does Sequenom (NASDAQ:SQNM) fit the bill? Let's take a look at what its recent results tell us about its potential for future gains. SQNM Total Return Price data by YCharts. Source: YCharts. * Period begins at end of Q1 2010. 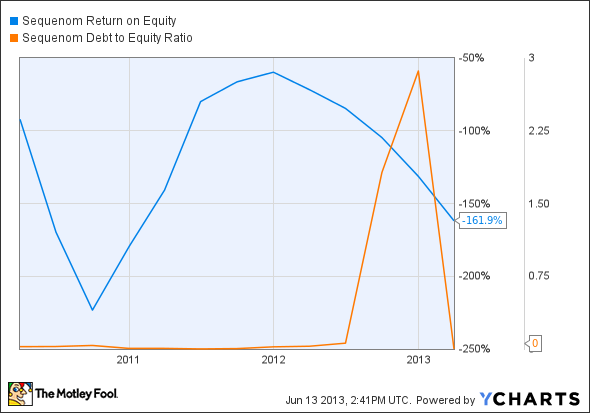 SQNM Return on Equity data by YCharts. Source: YCharts. *Period begins at end of Q1 2010. Sequenom has put together one of the best scores ever mustered by an unprofitable company, missing out on a perfect score only because its return on equity has tanked over the past three years. But should investors really be cheered by this apparent upward momentum, in light of its weak share performance and continued unprofitability even during a period of rapid revenue growth? Let's dig into some key facts about Sequenom to figure out if these results portend better days. Investors have begun to warm to Sequenom's top-line growth, as the company's latest earnings report showed a divergence between revenue and profit that was nevertheless worth a big boost in share price. The company's flagship MaterniT21 test has now been run more than 100,000 times, and hopeful notes from Sequenom's CEO on the potential for insurance reimbursement were no doubt well-received. However, Sequenom's success is hardly assured in the fiercely competitive sequencing field, particularly following a wave of consolidation this year that saw machine maker Illumina (NASDAQ:ILMN) pick up a similarly positioned diagnostic company and that recently delivered Life Technologies (UNKNOWN:UNKNOWN) into the arms of Thermo-Fisher Scientific. Sequenom may be debt-free, but it doesn't have the same resources as these two companies, which have been the driving forces behind the Moore's-Law-plus pace of sequencing cost declines. These two buyouts also reduce the likelihood of a Sequenom buyout, reducing investor options somewhat. At least Sequenom has a thumbs-up from OB/GYNs for MaterniT21, which is going to be a huge boost in visibility from the company's key physician specialists. Today, Sequenom has some of the qualities that make up a great stock, but no stock is truly perfect. Digging deeper can help you uncover the answers you need to make a great buy -- or to stay away from a stock that's going nowhere.